For Alex’s 29th birthday, all of her friends got together to buy her an ipad. I made a case for it which included each friend’s name. You can see the soot on the wood here. The initial coat or two of finish mean that that can be wiped off easily. I unfortunately don’t have a photo of the completed object. I finished it on the bus on the way to Toronto… It was similar to a Dodo case. I used techniques I learned doing bookbinding to make the outer case: bookboard covered with leatherette on the outside and some beautiful handmade paper on the inside. 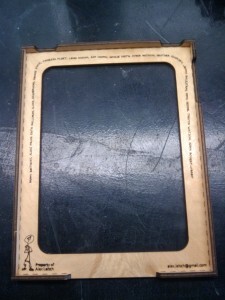 An elastic glued inside the case to hold it shut. Instead of using precision cut rubber to hold the ipad in place (the dodo technique) I used two or four pieces of elastic across the corners. Underlay is a lovely material. That’s what thin plywood meant to go underneath flooring is called in Canada. It’s pretty, uniform, and plays nicely with the laser cutter. You can reliably cut through it and engraving likewise works well. My initial tests resulted in the wood getting covered with soot which got worked into the grain when I tried to rub it off. If you’ve got air assist, you likely won’t have this problem. 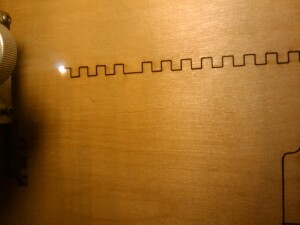 An easy fix is to apply two layers of finish to the wood before cutting it. Then the soot can be easily wiped off. You can find a draft svg on my github. 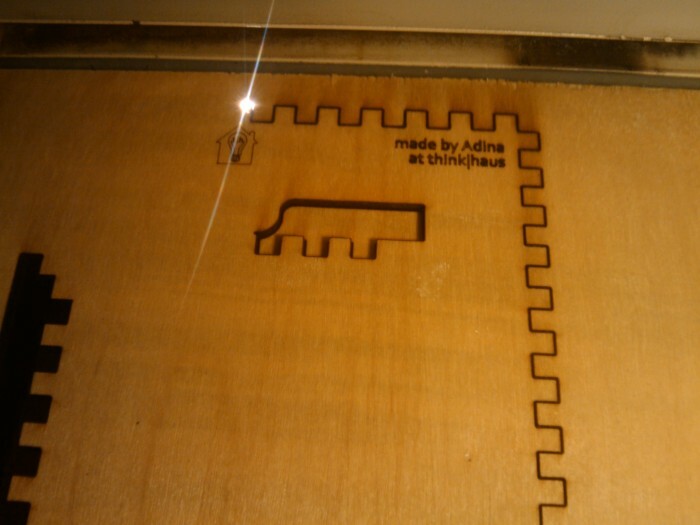 This entry was posted in laser and tagged lasering wood, think|haus.